A few weeks ago, I showed you my Kids' Bathroom Makeover. 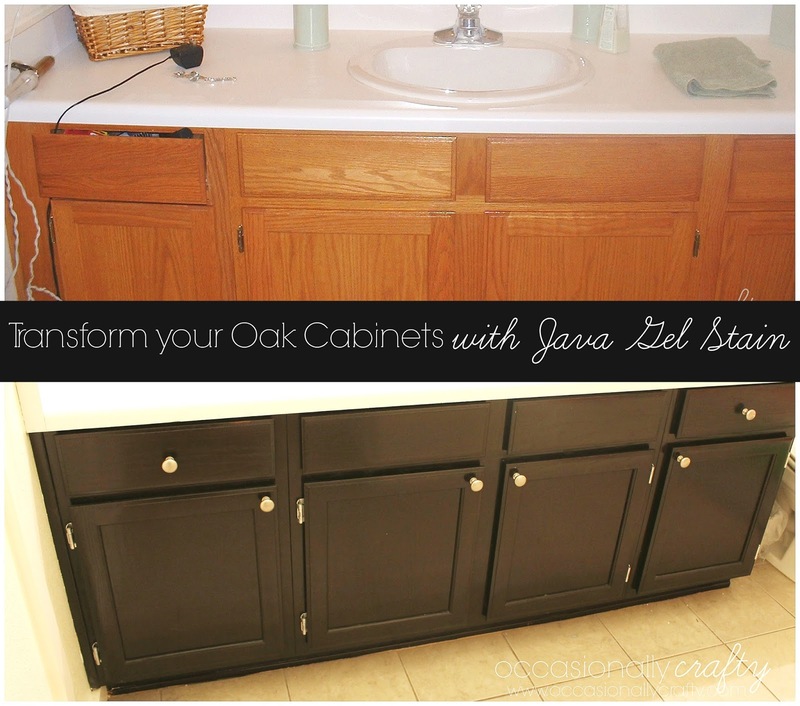 By far, my favorite part of the makeover is the transformation of my golden oak cabinets using Java Gel Stain by General Finishes. I finally got around to writing up a tutorial for you, as well as some things I learned if you want to give it a try yourself. First, let me just say that this post is not sponsored. I read several posts I found on Pinterest extolling the virtues of the gel stain, so I knew I had to try it. The only thing is, it can be hard to find. Here in Phoenix, I had to go to a tiny little vintage thrift store to find it. Luckily, you can order it on (affiliate link)Amazon here Just make sure to plan in time for shipping, and while you're there, order the sealer as well. There are other colors besides Java. This color is a rich dark brown, which is important to know because the pictures almost appear black. Make sure you pick the color you really want. Application: 1. Prepare your surfaces. If you are using previously stained cabinets, like my golden oak ones, you don't need to sand or strip them at all! Just wipe them down with soapy water and dry. Make sure any gunk or debris is cleaned away. Remove all hardware (keep track of which door or drawer they belong to!) 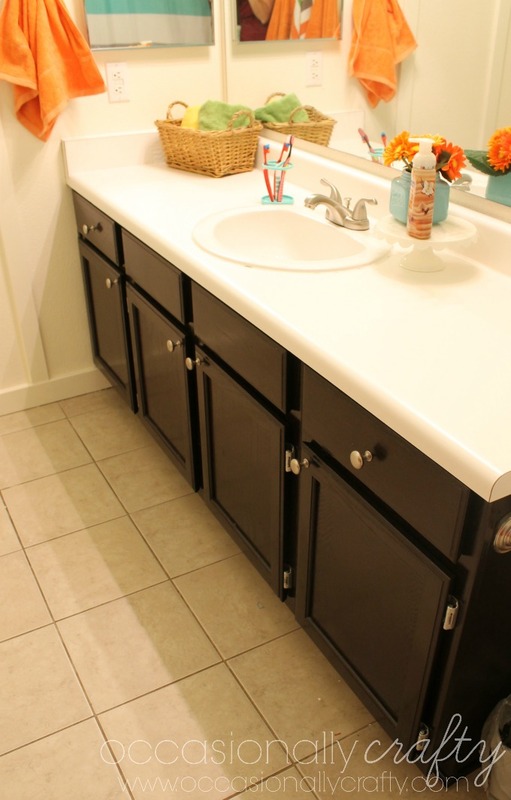 Tape your floors and walls, and around anything on the cabinet itself you don't want stained. Lay down plastic sheeting to protect surfaces if desired. 2. Place your doors on painting pyramids so you can paint the edges easily. Make sure you aren't in direct sunlight, or your stain will dry too quickly. I set up in my garage (sorry for taking your space, husband!) Using a sponge brush, paint on your first coat of stain. It is very thick so a little goes a long, long way- but don't be too stingy or you'll need more coats of stain. I chose to use the brush because I had lots of little nooks and corners on my doors. I've seen others use a long sock with a plastic glove on underneath. Use what you're most comfortable with. 3. Apply first coat. Try to go in the same direction with your brush on each section of door. Freak out because the first coat looks scary. It is splotchy and you can see all your brush strokes. I promise it will get better. I painted the front sides in the morning and let them dry for a few hours, then came back in the afternoon to flip them over and stain the back sides. In between, I went inside the house and painted the cabinet itself in the bathroom. Let first coat dry overnight. *Side note- this works on wood veneer or fake wood too! Parts of my cabinets are not real oak, and those parts took the stain just as well as the real wood did! So just stain it all. 4. Apply second coat directly over the first- no sanding needed. Again, do the fronts in the morning, backs in the afternoon, and dry overnight. You should see much better coverage and your brush strokes should blend in easily as it dries. 5. Apply a third and final coat in the same manner. Let dry overnight. 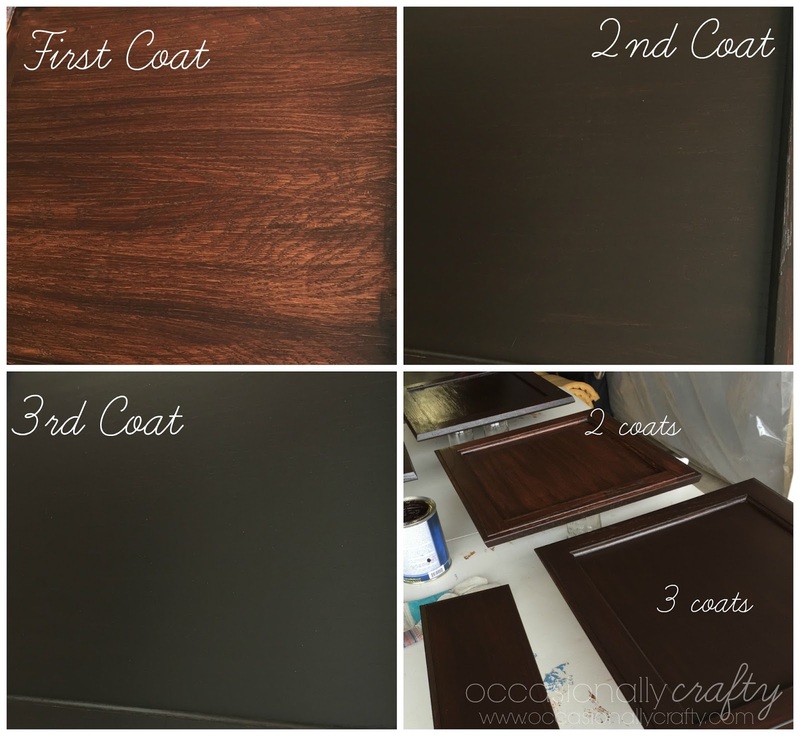 I've put together a collage so you can see the difference each coat makes. In the 2nd and 3rd coats, you can't see my brush strokes at all! 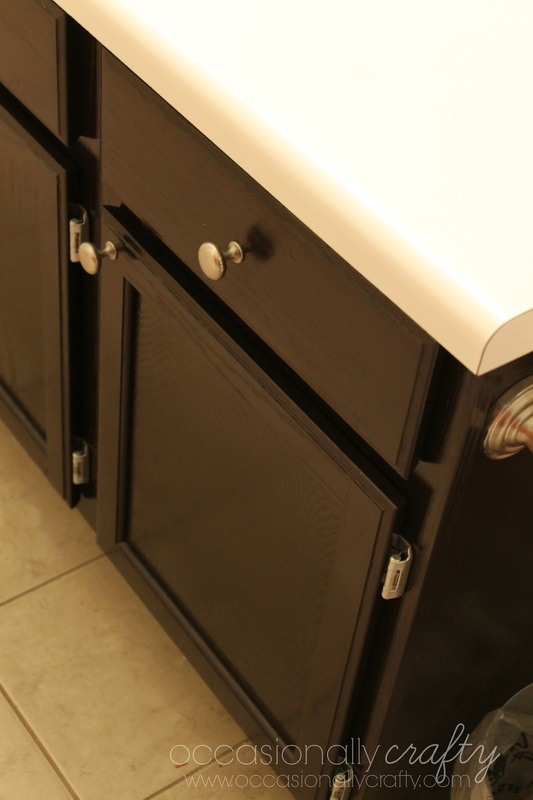 You may need to touch up a few spots after the 3rd coat, but if not, continue on to seal your cabinets. 6. After you are happy with the coverage and it is completely dry, apply two coats of sealer. Sealer dries much more quickly than the stain, so I did one coat in the morning, then returned and did a second coat in the afternoon. Sand lightly in between coats for even coverage. *Please for the love of gorgeous cabinets, choose a high quality polyurethane sealer. You don't want all your hard work to go to waste! 7. Let cabinets dry a full 24 hours after applying the last coat of sealer before moving them. I actually moved them inside after 24 hours, and then waited another few days before hanging them. That's partly because I had to spraypaint my hardware and buy the knobs I wanted, but you might want to think about doing that too. It would stink to spend all that time and effort only to get a bunch of chips while hanging the doors. 8. Reattach hardware. Drill holes if attaching knobs or handles. Rehang doors. Apply bumper pads on the insides of the doors to protect them from being chipped when being closed. Enjoy your gorgeous cabinets! Huge difference, right? I love it so much! If you have any questions I'd be happy to try to answer them- just leave me a note in the comments or email me. Have a wonderful weekend and have fun staining! I may be linking this post up to some of these parties- check them out with me! Thanks so much- I love it too! It was time-consuming, but definitely easy! I really think anyone with patience can do it! WHAAAT?! That is a crazy before and after! 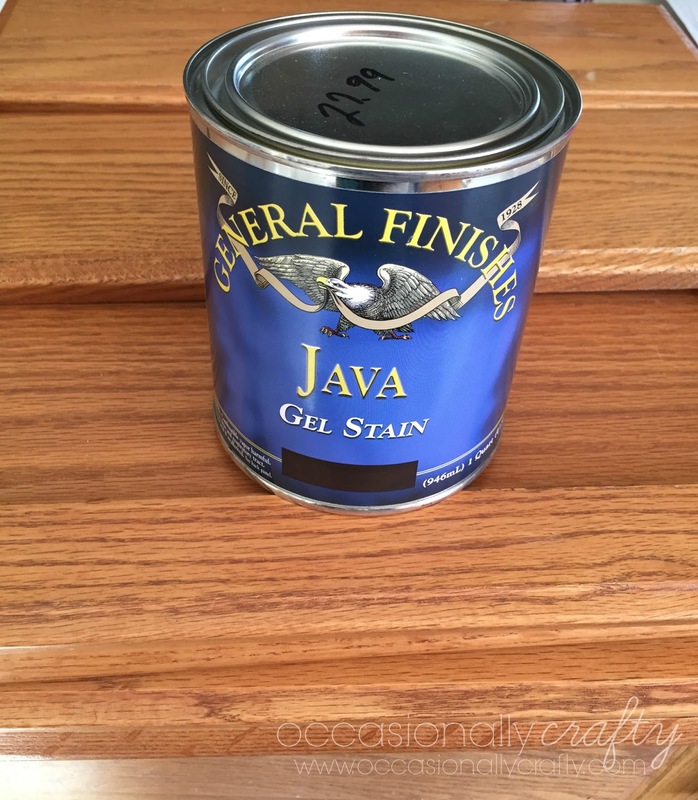 I've done a decent amount of furniture restoration and home improvement, but never used gel stains. I am so impressed! I know Brooke- I didn't believe how easy it was until I tried it myself! My cabinets had that shiny varnish on them and the stain went right over it- no problem at all! I am definitely a fan of gel stain and will be using it again soon! This looks amazing! I need to do something like this in 2 of my bathrooms....I am scared though! I try projects and they don't always turn out!!! This one is foolproof I promise! Wow! Those look so much better painted. You did a fantastic job! Wow, what a transformation! Those cabinets look great! Those look amazing. We have light oak cabinets in the bathroom with some great ceramic tiles on the floor but it is so much brown. I've been debating a change and I love the look of this. what a transformation! They look a million times better. New look without new price tag! Wow, that is a huge difference! It looks so smooth and even! I would love to try this out! WOW and what a transformation from old to new! I did not know one could use a product like this over wood, but now I do! Great job! Oh snap! I am loving that new color! I cannot wait to transform cabinets and do upgrades in our home, once we settle! Definitely a huge difference in those cabinets! They look great. I doubt I would attempt to do this as knowing me there would be more stain on me and the surrounding taped off areas then the cabinets! I absolutely adore the darker stain! It looks like totally new cabinets. We have a lot of rooms to renovate, and I will definitely be doing this color stain in one of my bathrooms. Enjoy your new look! I love the new look! I prefer the darker color a lot. I have a cabinet that needs to be transformed. Thanks for this. I like the darker brown shade now since it's less prone to getting dirty. It also looks so elegant with the finish. Wow - that's such an amazing transformation! I definitely want to do that with our cabinets at home. What a huge transformation! It looks awesome! It's amazing how the simplest change in color can make the entire room look totally different. Wow, that color came out just gorgeous! We have a dark stain on our cabinets. I would love someday to have a white wash look to our cabinets. Oh my! I didn't know about Java Stain since this post! The cabinet turned out beautiful! I'll look for it in our local hardware store. I did something similar to my cabinet in the basement, but these are beautiful. I need to do that to my cabinets in the kitchen. Can't afford new ones, but these look like new. Great job. For such a dark and solid color, what is the advantage of stain rather than paint? Two things- one, you can still see the wood grain, if that's important to you. Hard to tell in my pictures, but that wood look is still there. Second, there is very little prep for the gel stain. With paint you have to strip the poly coating and sand the cabinets down, then prime and paint. So it's faster. I didn't see (you may have said it) but how many cans did it take you to do the kitchen cabinets? WE LOVE THAT STAIN! My hubby uses it for many of our wood projects. We can only buy it in a wood craft store across town from us in Indy. So, this post is just my bathroom, which only took maybe 1/4 of a can. I did use it onmy kitchen cabinets too, which took probably a can and a 1/4 of another (quart size). I had a lot of cabinets and drawers! I highly recommend ordering on Amazon. It came in just a few days and it was packed very well to protect against spills or dents in the can.